Marta Coursey, Director of Communications, WSU College of Agricultural, Human, and Natural Resource, (509) 335-2806, marta.coursey@wsu.edu. When Heiko Jansen’s familiar face approaches, Kio and Peeka are all attention, their big bear muzzles filling the pen door. A few days ago, the 11-year-old, 400-pound female grizzlies spent 95 percent of their time in a lethargic state—just lying around. But with the coming of spring, everything has changed. After five months of hibernation, voluntarily going without food, water or bathroom breaks, the grizzlies at the WSU Bear Research, Education and Conservation Center are now fully awake. Their activity and their appetites increase every day. At the Bear Center, researchers like Jansen, an associate professor with the WSU College of Veterinary Medicine, are working to understand how this big change happens. Their discoveries can help wild grizzlies survive in a changing world, while providing clues to solve human diseases like diabetes and obesity. Bears’ annual wake-up is driven partly by environmental signals like light and temperature, partly by cues from their own bodies. WSU researchers have found that, even without external cues, bears’ occasional movement in their dens—twitching, stretching and changing position—will start to increase as spring nears. Grizzlies are already enjoying romps in the center’s two-acre pasture. In the wild, grizzlies get as much as 90 percent of their diet from plant sources. WSU bears are also dedicated grazers, gaining lots of nutrition from grasses, legumes and forbs. Hibernation is an amazing physiological feat. During hibernation, bears’ heart rates slow dramatically. At the same time, their insulin sensitivity is virtually eliminated, a condition similar to diabetes in humans. “Bears not only look like a diabetic, they’re also obese—massively obese, 40, 50 percent body fat,” said Jansen. That fat helps them survive. In fact, their bodies recycle water that’s produced by burning fat for energy. “They’re a perfect, self-sustaining unit—as long as they have enough fat,” Jansen said. Effectively, grizzlies have evolved ways to turn off obesity and diabetes. “We humans are not so lucky,” says Jansen. “It’s much harder for us to reverse those things.” Using samples from bears’ muscles, liver and fat, the WSU researchers are trying to find out how it’s done. The center’s new understanding of hibernation is also helping wild bears. Researchers have found that fatter bears emerge from their dens in better shape for survival. Fatter bears also have healthier cubs and larger litters. “Fatness is tied to the environment,” says Jansen. As environments change, and as humans impact their habitat, bears may face scarcity and increased competition for food. 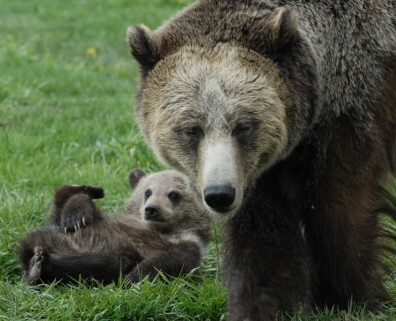 WSU research has found that, at less than 20 percent body fat, female grizzlies won’t produce a cub, despite breeding. Knowing that, wildlife managers could make conservation decisions by surveying the “fatness” and condition of wild bear populations. “This is how results here could be applied directly to wild bears,” Ware said.